Dan and Steve had been in LA for the holiday (and of course we'd been in Indy) so it had been a minute since we'd had a chance to hang out and catch up. And because they have a busy weekend coming up, we thought it best to have them over for dinner last night. Snoop Dogg was in the office last night so I stayed a longer to get some things done - thus, I was way behind when I finally got to Brooklyn and Pacific Green. But I decided to keep last night simple and after snapping up a couple quick ingredients, I was on my way home and behind the burners before I knew it. I thought everything was awesome. I know that the cajun one was a little too spicy, but I'm sorry friends! That's what I do! I think everyone enjoyed it anyway. They said they did anyway. The second option was OK. It was lacking something. I would have liked some anchovy but I wasn't sure it would go well with the crowd. I think I'd like to try doing these in the oven and finishing them under the broiler. Just when we have crowds. We'll see. I don't know if the quality level will be the same. It would just be nice to prep them and throw them in the oven. Anyway, this batch was nice. And it was great to catch up with the dudes. It's cold. Our heat isn't working. The week has been really busy. I had to fight through a wall of Christmas tree revelers just to get to the subway last night. When I got home, I wasn't in a mood to cook. So oddly, we went for Chinese delivery last night. That's right. You heard me. No Joya. No Zaytoons. No Cube 63. We went with a curve ball and called in China Hong. I mean, it's comfort food. Warm and filling. With Top Model and Project Runway episodes jam packed into the evening's viewing schedule, we just needed to kick back. And China Hong hooked us up with some typical Chinese delivery to help us get through it all. Guess what? We've been doing this silly thing an entire year! Whoo hoo! When we started, we had no idea anyone besides the two of us would actually read this thing. And although it's not much more than the two of us, we do have some loyal readers. And that's fun as hell. But we've evolved a little. We've made some good stuff. We've made some bad stuff. We've traveled. Others have cooked for us. We've had LOTS of delivery. It's been a fun year. Hey, we even got engaged. And food has been a huge part of it all. So for our one year, we didn't do anything too special. I was working late and we've just been generally so busy that there wasn't time to really plan. But I guess that's pretty fitting. That's how we do most dinners, so why not the one year dinner? Meena got us off to a great start with a couple appetizers from Fish Tales. We had some nice crabcake stuffed mushrooms and a few perfect shrimp with cocktail sauce. Small bites, but you know ... how can you hate a stuffed mushroom or shrimp cocktail? Go ahead foodies ... scoff. I love it. We served the whole thing with some boxed Thai rice. We've done the cherry sauce before. And the miso glaze thing. I figured I'd just merge the two. Turns out, it's not such a bad combo. It probably would have been better in the oven than on a skillet. But you know, whatever. It was a nice meal and the flavor was great. It's a subtle variation on one dish we've made a million times. I can't think of a better way to ring in the one year anniversary. We ain't going away ... get ready for another year of MOAP! First night back and we just couldn't cook. We had a nightmare of a flight and after waking up at 4:00 a.m. only to make it back to NYC around 1:30 p.m. for another long day at the office, when we finally made it back to Brooklyn, we were just finished. And what do you do in those situations? Call in the boys at Zaytoons. It was filling, delicious and pretty much perfect for our tired souls. Hi everyone. Remember us? The people who once updated on a daily basis? Well, we're back. We had some technical difficulties and a long trip to the homeland, but we're back, baby! There are a lot of photos up there. And I'll be honest, there are a bunch that I just didn't include. But I hit the highlights and I'll do my best to describe everything in as much detail as I remember. We started off last Wednesday with a bowl of Dad's beef and vegetable soup. He serves it with his jalapeño cornbread and it's pretty much the perfect union of flavor. It was a nice way to end our first night back in town. The next morning (Thanksgiving) Mom got us started with her baked eggs. I feel like this is where I first learned the basics of muffin tin madness. But I'm not sure. Anyway, this one is awesome. It's basically bacon wrapped around an egg baked in a cup with herbs. 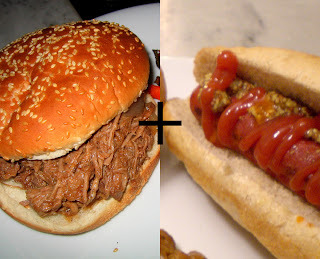 And then you top the whole thing off with Heinz 57 sauce. It's seriously perfect. I think we had some zucchini bread too? It looks like it. Before we even started breakfast, Dad had thrown his bird on the grill with some hickory out in the back yard. That's right, the man did his 19 pound gobbler on the Weber. He's pretty impressive right? Anyway, he did a great job and as you can see in the photo, he knew it. Everything was amazing. The smoky turkey. The green beans (I could have seriously eaten all of them). Awesome Thanksgiving meal. The next morning, Mom whipped up another little delicious breakfast treat - chile cheese egg puff. It's an interesting name, but it's actually really simple. Eggs, cottage cheese, green chile peppers. Some other stuff too. But in the end, a scoop of that stuff with some hot sauce and a bunch of citrus and bananas on the side? Awesome. There's a gap in here. Between breakfast on Friday and dinner on Sunday, we had random eating. A party on Friday with heavy appetizers followed by Broadripple drinking. A hungover Saturday morning followed by dinner at Mitchell's and some more drinks with Grant and Sara at their beautiful house. It was fun, but no photos. Sorry! The conclusion on Sunday night was supposed to be grilled pork chops, but because the weather didn't cooperate, Mom ended up baking them. She also threw together a simple salad with lots of cherry tomatoes, olives and a white balsamic dressing. Great pork chops, salad and some (not pictured) mashed potatoes - I can't think of a better way to end our trip home. Oh yeah, I can ... with Mom's Derby pie. Awesome bourbon soaked Derby pie. As you can probably tell from all the great food up there, we had one pretty amazing trip back to Indy. If you've read Memoirs over the last year, you know we're big fans of Ivo and Lulu. Honestly, it's still my favorite place to eat in this town. Even with the interior changes and everything else, I still love it. And if you know that, you might also know I nearly always get one of their alternative sausage dishes. Delicious wild boar with blueberry sauce. Rabbit with carrot and ginger. Amazing. So whenever I hit the butcher, I like to check out all the assorted sausages on display. Typically it's just like ... 30 varieties of chicken with garlics and apples, etc. But on occasion, you run into the duck, venison and rabbit that make me happy. It might not look like all that much, but it was delicious. Meena isn't a huge fan of fennel seed and like most sausage, they hid a few in there. I don't mind it, but they are powerful. So I get it. The cherry sauce was fantastic. Went perfect with the venison. Ah, sausage. I love you. Once again (this seems to be the trend), I forgot about another milestone. I didn't plan anything big for 400. I just made dinner. Lucky for me, it was the best chili I ever made. It's awesome that the world works itself out sometimes. We'd been kicking around the concept of chili for some time. We just hadn't made it. I'm not sure why. I think we had some warm days. And some lazy days. Regardless, we didn't get around to it until today. Amazing. I amazed myself with this one. Polished off with a dollop of sour cream? The perfect Sunday meal if you ask me. I realize adding dark chocolate to chili is no exclusive trick, but man oh man - it really takes chili to another level. I don't think I can make it any other way from here on out. 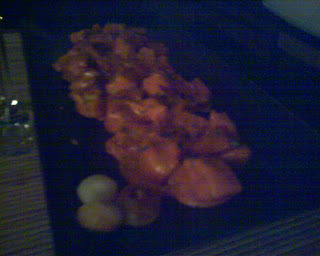 The meat cooked all day and shredded into perfection. I made enough for several more bowls. I think I want to eat them all right this second. Stay tuned for the one year anniversary! I'll try to do something cool for that one in about a week. We were really treated to some special stuff last night. Our friend Matt (aka, the Daily Worker) had James, D, his sister and the two of us over for an amazing little meal he whipped up. This was our first time at Matt's East Village abode and it was pretty much fantastic from start to finish. We got things going with delicious little wheels of polenta and a pesto Matt picked up from a secret spot. The pesto was amazing. I think it was jalapeño, cilantro and walnut? Whatever it was, it was awesome. The next phase was a cilantro and bean soup that was pretty much perfect. The flavor was stellar. Matt was essentially acting like a flavor DJ at this point ... making perfect transitions from one dish to the next. The main course was Asian inspired and it came out just as great as the first two offerings. He did salmon fillets with a honey and soy glaze, asparagus with a mustard vinaigrette and sweet potatoes with olive oil and pumpkin pie spice. And just when we thought we couldn't eat anymore, D made sure we were totally stuffed and completely content with a banana bread pudding that was ... amazing. It was seriously one of the best desserts I've had anywhere for a very long time. Restaurants be damned - D is number one in the dessert game. She topped it off with some soy ice cream for Matt and boy oh boy. Perfect. Awesome night. Good vinyl, great friends, tons of wine, a KITCHEN TABLE, amazing food, a sink full of dirty dishes and about 3.2 million laughs. I had every intention to make what you're seeing up there with my own two hands, but when I started to think about it, it was much more cost efficient to just have Court Street Bagels do all the heavy lifting. By the time you buy all this stuff, you spend a fortune. And have a bunch of leftover. So we just figured, let's just do take out. After a very long week (I know I say that a lot, but this was a monster. Mad annoying on many fronts), we decided that some chic Korean in Park Slope was in order. We'd had our eye on this spot for a couple weeks and we just figured it was time to pull the trigger on Moim. Before we left, Meena got us started with some snackies. Chicken meatballs with pineapple and soy, crab cakes and a little cheese spread. Everything was picked up from Chop Chop on Smith. Very nice. After our snacks, we trudged through the cold and gross weather over to Park Slope and the second we walked in, all felt right with the world. Everything was awesome. My bi bim bop was one of the best I've had and Meena's was just decadent. Grilled pork spare ribs with sweet, spicy sauce? Awesome. The sweet potatoes in her dish were odd. They were sticky and crispy, but for some reason, they were served in a bowl of ice water? Odd. And at the end, they were soggy and cold. They were great when hot, though. The decor was funny. Why do all Asian places need to be so modern? I'm not complaining. The place looked great. Just sayin'. It's a funny trend. Sorry for no photos. I forgot. At the end, it was just bowls. Didn't think that would be all that appetizing. So you got their business card. Sorry! I was at another Men's Journal event last night and subsequently got home rather late. It was a crazy fun event, but I didn't eat much and probably had a few too many patron drinks for a Thursday night. We had to stay late and clean though, so what did you expect?!? Anyway, Meena had picked up some Cube 63 before I got home and as always, she enjoyed her spread very much. I didn't have quite the same experience. I was going to order something but I didn't have any cash. Things looked grim. And my tummy was rumbling. So I set out on a mission to scour our cabinets for ANYTHING. Turns out we had some more of our roasted pork and a couple chicken chipotle sausages. I ended up making a mish mash that eventually produced two half sandwiches ... one pork bbq with hoisin and the other contained hoisin and sausage. Again, I was a little tipsy, so whatever. I wanted food and I found some. Nothing special. Just ... food. So that thing up there is pizza. Just in case you're wondering. Because I'm sure you are. 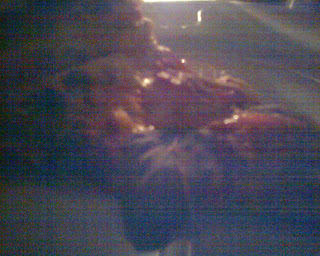 Anyway, we went to Lucali last night as soon as I got home for some wine and Carroll Gardens' (or Cobble Hill's for that matter) finest pizza pie. It's only Thursday, but it's already been a long week and it just felt right to run out and do the romantic BYOB pizza thing on a Wednesday night. So we did. And it was lovely. We didn't get crazy with toppings last night. Meena wanted pepperoni and I wanted basil. So we had a pepperoni and basil pie. We then proceeded to eat every bite. I didn't feel any remorse when the forks hit the table. I bite my thumb at you, gluttony! What fun is life if you can't throw fatty Italian sausages in there once in a while? No fun, I say. I have another event for MJ tonight, so tomorrow's post will be rather weak. Stay tuned! I gotta be honest. My food doesn't look all that appetizing. It was good. I promise. But for some reason ... it just looks ... less than edible. So I got home late because my friend Ben finally moved to New York and we went out for some drinks to celebrate the fact he's here. It was weird and over in Hell's Kitchen, but it's always good to see Ben and I'm super excited he's here. Meena was kind enough to go ahead and order the best Joya had to offer before I got home. So when I walked in the door, we were ready to rock. Meena is always nice enough to ask for my food super spicy, but it rarely comes out that way. They must think we're not able to handle it. Little do the know, I crave the heat. Anyway, as always, it was great. We're mirroring Last Night's Dinner with this three nights of pork thing, but it's totally unintentional. And believe me, their choices are far more refined than ours. We're rocking tacos and bbq. It's not that serious. 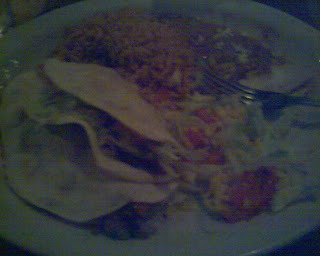 So as you can see, I took some crappy photos of our tacos last night. I thought my camera was dead (it wasn't) so I just took a camera phone shot to make sure we had everything documented. Sorry, friends. Meena stopped by the California taco joint on the way home and picked up some guacamole and salsa. The two salsas (verde and fresca) were nice. The guac was a little bland, but not bad. 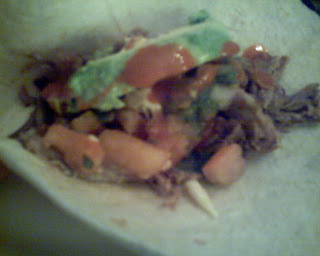 I threw some canned salsa, a little white vinegar and cayenne pepper into the warmed up pork for a little added kick. 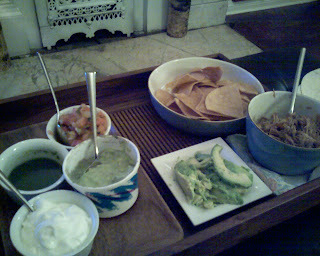 Then we just added some flour tortillas, fresh avocado and low fat sour cream. Meena had two and I had three (I'm fat). It was awesome. I wonder what we'll do with it tonight? Tonight we had good food, but for a second week in a row, I watched my Colts lose. Sad. Tonight they beat themselves and it was massively depressing. Adam could have won it, but it's not all his fault. The whole team played like crap. It came out perfect. The meat fell right off the bone and everything was juicy and delicious. I reserved about half of it for the week and the other half we mixed up with some barbecue sauce and plopped it on a bun. BBQ sandwiches, y'all! Veggies came out perfect. Moist and sweet. With a little savory kick from that sea salt. Awesome. I should check out last night's dinner for ideas on how to use the rest of this. Or maybe I'll just spend all my free time tomorrow dreaming up ways. That sounds more fun. I'll do that. This was an odd night. 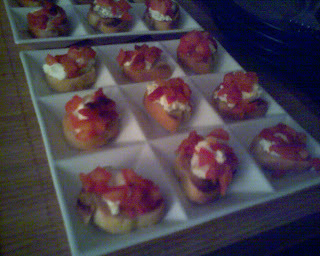 We started out at Dan and Steve's for a delicious little spread of goat cheese bites and creamy, tangy potatoes. They were delicious. Dan did an amazing job. So the night began with great conversation and delicious little bites. Then we went to Convivium Osteria in Park Slope. It started out well. Short wait for a nice table in this cozy little spot on Park Slope's most busy street. The lady gave our table away. We waited an extra 30 minutes. She gave us some wine to apologize. We sat down. They were rude and made me take off my hat (it's Brooklyn, people. It's cold. Let me be!). Then the food came and it was amazing. So it was up and down. 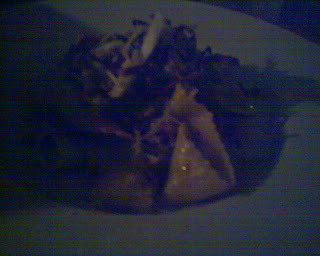 Meena had pappardelle in a wild pheasant ragu. 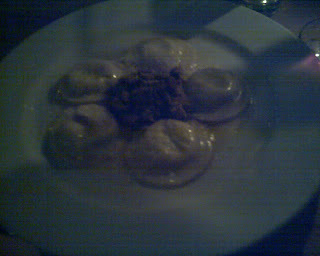 I had an amazing ravioli with green apple and cinnamon in a duck ragu. I am not a huge Italian fan, but this food was out of this world. And not that expensive. Some of the best food I've had in a very long time. But the staff nearly killed it. Jerks. I'd totally recommend this place anyway. Terrific food. Great environment. Slightly crappy staff. Great company though. Thanks Dan and Steve! Last night Meena somehow injured herself on a subway turnstile so our plans for some Park Slope Korean were dashed due to this unfortunate ankle injury. Not a problem. It was Friday and we were hobbling distance from a neighborhood favorite - Lobo. We decided not to do anything crazy on this Friday night. It was a long week so we needed a couple margaritas and some comfort food. I piled on the hot sauce and had a hot, delicious meal. Meena enjoyed hers. Another annoying week comes to a close. Thank God. We had a Rolling Stone event last night and I was working so I knew food wasn't going to come my way with any consistency. 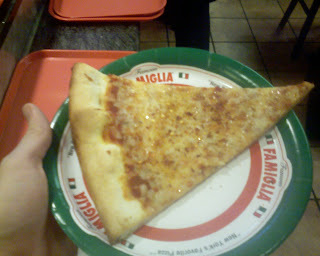 To avoid the 10:00 hunger pangs, Vicky and I hit one of those random pizza joints in Times Square on the way over. Have you ever seen that episode of The Office where Michael comes to New York and says his favorite slice of New York pizza is at ... Sbarro?? There were lots of tourists in there saying the same thing. It was kinda funny. The pizza was ok. Not great. But warm and filling. Anyway, the event went well and on the way home I was still starvin' like Marvin. So Matty Chaymez and I rolled down to Cinderella falafel for some of the East Village's best gyros. In my humble opinion anyway. I learned this morning that Meena had pad thai from Joya last night. That's her usual when I get home in the middle of the night. She said it was delicious. No surprise. Good night. Late night. But a good night indeed. I was dead set on cooking last night so even though I was going to get out of the office a little later, I figured I'd just stop by Whole Foods and pick up some gear. This one was partially inspired by a joint I saw over on Cook. Eat. Fret. Not really the same thing, but the whole scallop with veggie cake thing ... that's the inspiration. Then I just seared off the scallops and tossed around some pomegranate seeds and more diced jalapeño. It wasn't a hearty meal (I should have added more of the potato cakes), but it was a good one. I needed a little more green. I thought I'd have more pepper, but it was on the small side and went quickly. Still, good. Don't expect much for tomorrow. I have an event and probably won't be home for any foods tonight. Again, we both got home late last night. Meena had an event and I had to work. I had an idea to get some leftover sausage in a pasta dish but in the end, I was just too tired and I couldn't find that pasta box I thought I had in the cabinet. So I had a little shredded wheat with worcestershire sauce (thanks, matt!) and hung out until Meena got back. When she rolled in, we opted for some cold food on this cold night. Well. Not totally cold. I had soup. She had shumai. But you know. The main course was cold! Can't complain. Cube 63 is always good. We're really lucky to have it so close. Delivery sushi is never quite as good as its restaurant counterpart, but it's still awesome. And someone brings it to your door.